Riviera Nayarit Mexico Blog: Be in love with the Riviera Nayarit! Be in love with the Riviera Nayarit! • The 32 participating hotels are offering incredible promotions that include discounts ranging from 25% to 57%. 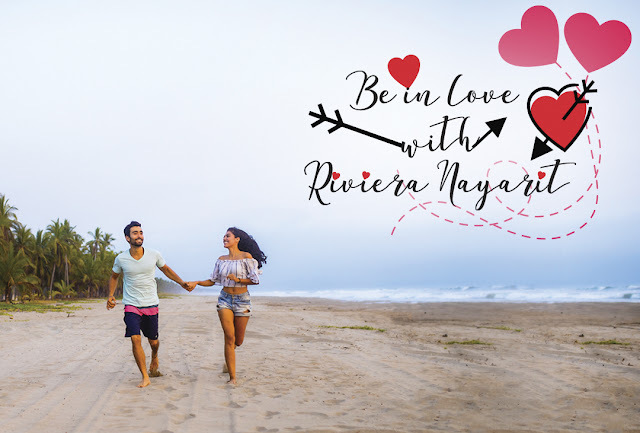 This month is officially dedicated to love, and the Riviera Nayarit hotels are ready to welcome everyone looking to enjoy a unique moment with that special someone. To enjoy an unforgettable Valentine’s day, pamper yourself and stay either in one of the five star resorts or in a romantic little hotel nestled in the jungle, the Riviera Nayarit has accommodations to suit every tourist’s taste and budget. There are 32 hotels participating in the Valentine’s Day Seasonal Promos that are running from February 9th through March 8th, 2018; with very attractive discounts that range from 25% to 57%. There are more interesting promotions offered by the Riviera Nayarit Conventions and Visitors Bureau, the Bahía de Banderas and Compostela Hotel and Motel Associations, some of them include no-interest payments for 3, 6, 9, and 12 months; anywhere from $600 USD to $1,350 USD in resort or spa credits. Some include free WiFi, free bicycle and kayak rental, unlimited rounds of golf, theme nights, free parking, and interactive programs. Nuevo Vallarta and Flamingos: Dreams Villamagna Nuevo Vallarta; Grand Velas Riviera Nayarit All Inclusive Resort; Hard Rock Hotel Vallarta; Hotel Las Palomas Nuevo Vallarta; Krystal Grand Nuevo Vallarta; Marina Banderas Suites; Marival Residences Luxury Beach Resort All Inclusive; Marival Resort & Suites; Occidental Nuevo Vallarta; Ocean Breeze Hotel Nuevo Vallarta; Villa Varadero Hotel and Suites; Paradise Village Beach Resort; Villa del Palmar Flamingos Beach Resort & Spa; Villa La Estancia Luxury Beach Resort & Spa Riviera Nayarit; Riu Jalisco; Riu Palace Pacífico; Riu Vallarta; Samba Vallarta. La Cruz de Huanacaxtle: B Nayar; Grand Sirenis Matlali Hills Resort & Spa; Vallarta Gardens. Punta de Mita and Litibu: Four Seasons Resort Punta Mita; Grand Palladium Vallarta Resort & Spa All Inclusive; Iberostar Playa Mita; Imanta Resort Punta de Mita; Rancho Banderas All Suites Resort By Marival; St. Regis Punta Mita Resort y W Punta de Mita. Bucerias: Refugio del Mar; Royal Decameron Complex; Vista Vallarta All Suites on the Beach. Rincon de Guayabitos: Decameron Los Cocos. The Riviera Nayarit Convention and Visitors Bureau (CVB) and the Bahía de Banderas Hotel and Motel Association reaffirm their commitment to the strategic promotion of the destination, seeking areas of opportunity, consolidating new markets with the purpose of increasing tourism, with the support of the Government of the State of Nayarit via the Tourism Promotion Trust.